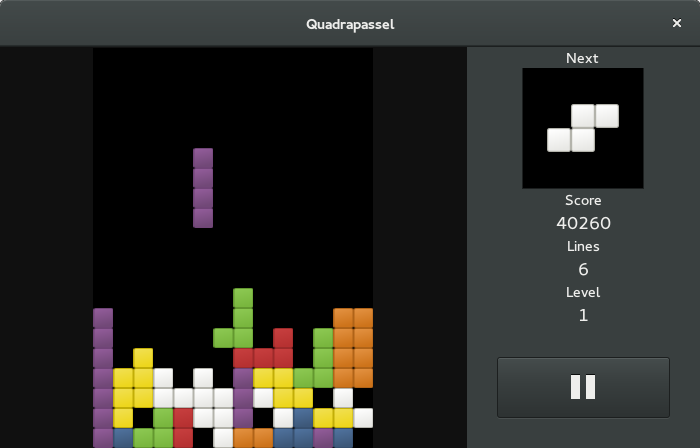 Quadrapassel comes from the classic falling-block game, Tetris. The goal of the game is to create complete horizontal lines of blocks, which will disappear. The blocks come in seven different shapes made from four blocks each: one straight, two L-shaped, one square, and two S-shaped. The blocks fall from the top center of the screen in a random order. You rotate the blocks and move them across the screen to drop them in complete lines. You score by dropping blocks fast and completing lines. As your score gets higher, you level up and the blocks fall faster. In previous versions, the game was known as Gnometris.